FinDecor has been performing window frame painting for several years. It does not matter if your windows are simple or multiple if your frames are made of aluminum or PVC, we have the right solution for you. A curtain wall is an exterior wall that is mostly made of windows or rows of windows. We often find them in Montreal on corporate buildings like office towers and skyscrapers, but also on condo buildings. Window walls divide into three parts: mullions, spandrels, and windows. Windows are the frames dividing the windows and holding them into place. Spandrels are horizontal or vertical sidings between the rows of windows. At your request, FinDecor does the painting of sidings (spandrels) and frames (mullions) by taking care of protecting your windows. Curtain walls are often in aluminum for commercial buildings and in PVC for residential buildings. Contrary to popular belief, aluminum and PVC are materials which can be painted. We normally use a 100% acrylic paint for this type of projects. This paint is not only very adherent on most surfaces, it’s also more flexible and resistant to weather conditions: it does not crack under the sun or frost. When the conditions allow it, we prefer the spray gun method. Don’t worry, we take time to cover properly your windows to protect them from paint droplets and drips. If it’s impossible to use a spray gun, we could choose the brush and roller method. 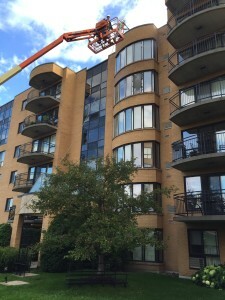 Having your curtain wall repainted offers several advantages. Let’s mention durability: an exterior wall for which the maintenance is regularly done might last 20% longer than a wall that is not. Also, the aesthetic enhancement is important: for a fraction of the cost (approximately 5% of the building value), your building will look like new again. This is good for your brand image and your business reputation. Questions? Contact us: a painting expert will answer you in a timely manner.